Most patients have heard the phrase “slipped disc”, “ruptured disc” or “disc popped out”. While these are certainly descriptive terms, they can be somewhat misleading. What these terms are referring to is a disc herniation. 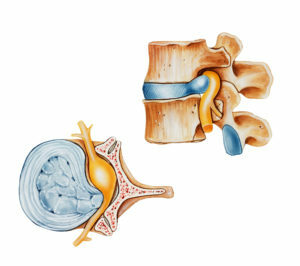 Disc herniations are common, especially in the low back (i.e. lumbar spine), and at our practice we treat this condition regularly. To relieve nerve pressure and leg pain, surgery usually involves removing part or all of the damaged disc. This is called a discectomy. At our practice, this procedure can often be done utilizing minimally invasive techniques. Minimally invasive surgery uses smaller incisions and specialized technology such as microscopes and endoscopes (“mini-video cameras”). Microdiscectomy and minimally invasive techniques often result in quicker patient recovery times compared to traditional techniques, as they reduce trauma to muscles and minimize blood-loss during surgery. 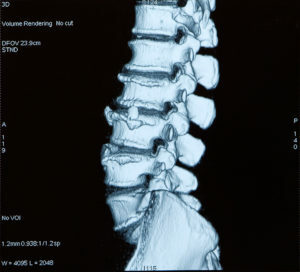 Spine fusion is rarely necessary when a disc is herniated for the first time. If necessary, the space left by the removed disc may be filled with a bone graft – a small piece of bone usually taken from the patient’s hip. 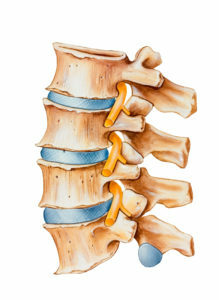 The bone graft or a bone substitute is used to join or fuse the vertebrae together. In some cases, specially designed instrumentation (such as rods or screws) may be used to help promote fusion and to add stability to the spine.